20/10/2016 : It is with profound sadness that we have learned today that Ogholai, the young mother operated a few days ago, had passed away. Her postoperative state deteriorated all of a sudden and the FMIC medical team was unfortunately unable to save her. All our thoughts are with her family. The members of the cardiac surgery team will never forget the evening of Monday 17 October at the French Medical Institute for Children (FMIC). At 5:34 pm, Ogholai, a 32-year old woman, was lying on the operating table ready to undergo open-heart surgery to remove a tumour known as myxoma. This may already look like a major achievement for a country like Afghanistan, but such an operation has become common practice for Dr. Bina, cardiac surgeon on a mission for La Chaîne de l’Espoir, and his team of anaesthetists, perfusionists, medical interns and OT nurses, who perform on average three open-heart surgeries every day. But that evening, it was not just about Ogholai. Two hearts were at stake since Ogholai was three months pregnant. According to Dr. Bina, there is only one case of myxoma in a pregnant woman in 100,000. After travelling for one month from her Jowzjan province in northern Afghanistan, Ogholai, her husband and her father-in-law arrived at FMIC around 1 pm. She needed urgent surgery as the tumour was threatening to break, which would have gravely endangered both the mother and the child’s life. Born into a very modest family, Ogholai could not pay the €2,000 required for the surgery. The FMIC welfare programme assumed a portion of the medical costs so that Ogholai could receive surgical treatment. 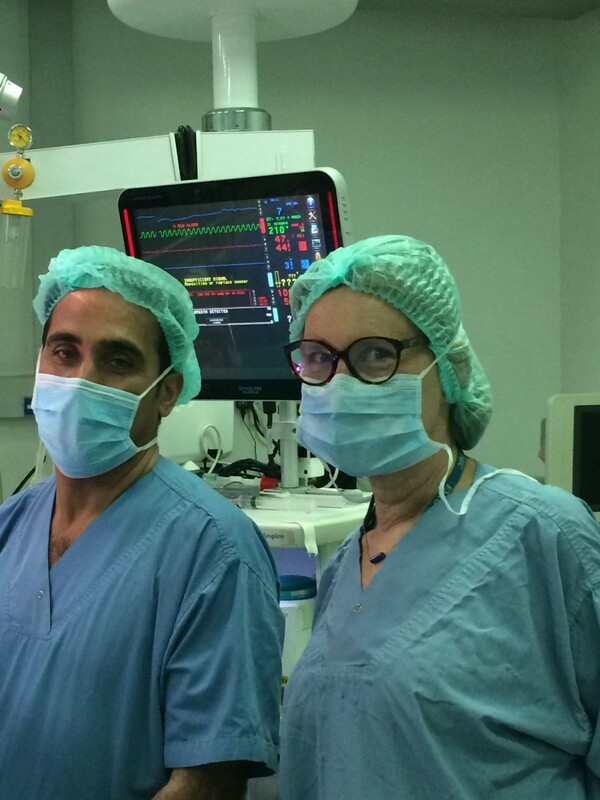 Dr. Jean-Michel Muray, obstetrician-gynaecologist and head of the Pontoise hospital, together with Agnès Simon, midwife and deputy chairman of the European Association of Midwives, were able to assist the cardiac surgery team and monitor the baby’s health status. Both volunteers with La Chaîne de l’Espoir, they were in Afghanistan as part as their coordination mission for theupcoming opening of the FMIC maternity ward. 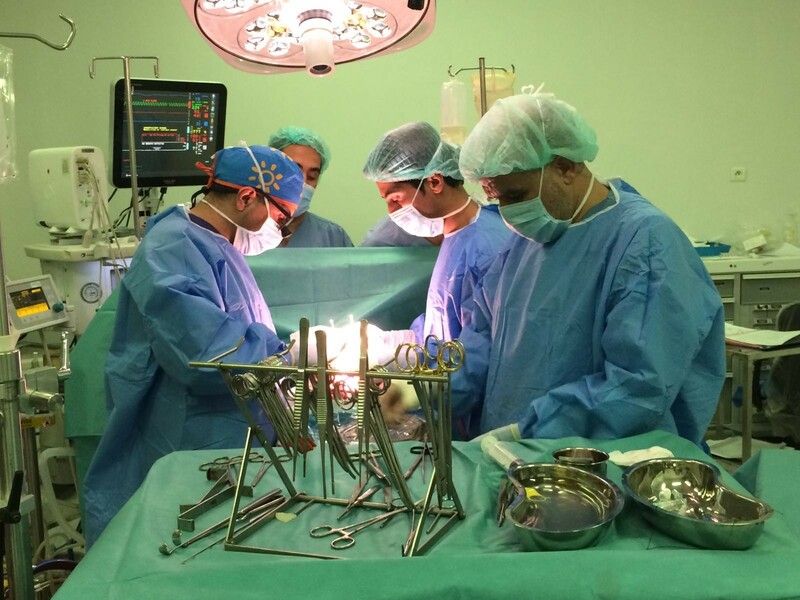 The operation took place in a peaceful atmosphere, with precise gestures and professionalism. At the end, the ultrasonography enabled them to hear the heart of the baby and relief surged in the room at once. After 4 to 5 days in hospital, Ogholai will be able to go back home in the best of shape and carry her pregnancy to term. The Mother and Child Centre and its obstetrics-gynaecology and neonatology departments, due to open at the end of the month, will be able to accompany her until she gives birth to her child. Such an operation is a first in Afghanistan and a genuine sign of hope for the future of the country’s women and children. La Chaîne de l’Espoir is proud to acknowledge the progress made within FMIC and warmly congratulates its teams.